• An instrument with strings stretched over a wooden, trapezoid box and played with small wooden mallets called hammers. • Thought to have originated in Persia 2000 years ago but theories differ. • Called by many names as played worldwide: Hackbrett, Salterio, Khim, Santur, Santouri, Cimbalom, Tiompan & more. 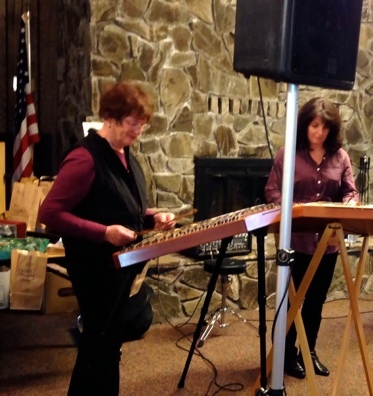 Patti Amelotte and Barbara Gershman have enjoyed playing their hammered dulcimers together for many years, especially at Chapman University’s annual Wassail as well as at festivals and other events. Their duo is called “Better Than One” to illustrate that “The only thing that sounds better than one hammered dulcimer is two!” The magic of arranging for instruments with different ranges is evident in their performances. After earning a bachelor’s degree in piano performance Patti became fascinated with the hammered dulcimer. She has performed with several additional bands including Looney’s Fortune, The Short & Curly Show, Blackthorn, Granuaile, and Crannog as well as being a soloist. She performed The Lord of the Rings Suite with the San Diego Symphony. Patti teaches piano and hammered dulcimer lessons in Southern California. Barbara first heard the hammered dulcimer on a recording in a Yosemite gift shop. Musical training with Patti has led to becoming a founding member of Dulcimania, a Celtic trio that has performed for many years at Alta Coffee in Newport Beach. She also plays hammered dulcimer and accordion for the duo & ensemble, Legacy, which entertains and educates at libraries, civic groups, and social functions. 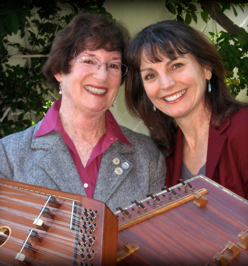 Both Patti and Barbara are very active in promoting the hammered dulcimer and traditional music through music organizations and festivals in southern California.